The 2013 Mustang was handed over in front of a crowd outside the Las Vegas convention center during the 2012 SEMA Show, with Gittin and Pawlak doing a burnout in the car to break in the brand new Falken tires. The new owner had some fun with his new Mustang as well, doing donuts in his first time behind the wheel. As a bonus, the winner also got an HPI Racing R/C Ford Mustang with a matching paint job. 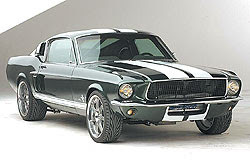 You can watch the Falken Tire 2013 Ford Mustang being delivered to its new owner in the video below. This entry was written by by MustangsDaily (Mustangs Daily) and posted here on Thursday, November 8th, 2012 at 12:32 pm and is filed under falken, Falken Tire, falken tire 2013 ford mustang, justin pawlak, sema 2012, vaughn gittin jr., Videos. This article was not written by us, rather gathered using RSS feeds listed here. We take no credit for this article. You can leave a response, or trackback from your own site.